Poás (Costa Rica). A phreatic eruption from the summit lake Laguna Caliente ejected grey and sulphur-scented sediment onto the southern flanks. Seismographs showed no precursory signals. Semeru (Indonesia). During November 2009-February 2010 ‘smoke’ was often seen when weather permitted rising 50-500 m above the Jonggring Seloko crater. During 25-28 February incandescent rock avalanches reached 750 m from the crater. The Alert Level remained at 2 (on a scale of 1-4). Soufrière Hills (Montserrat). During 19-26 February activity from the lava dome was at a low level. A few rockfalls originated from the inner walls of the collapse scar formed during the 11 February event on the N flank. Small areas of incandescence on the dome were noted. Gas emission ratios were consistent with slow lava extrusion, but growth was unconfirmed. On 26 February scientists first saw the crater at the summit of the lava dome formed by explosions on 11 February. The crater was 200 m in diameter and 50-100 m deep. The Hazard Level was lowered to 3. Fuego (Guatemala). On 26 February and 2 March explosions produced grey plumes that rose to 4.1-4.5 km a.s.l. and drifted E and NE. Avalanches descended the S and W flanks. Weak incandescence emanated from the crater. On 2 March, ash fell in areas downwind. Karymsky (Russia). Seismic activity was occasionally above background levels during 19-26 February, possibly indicating weak ash explosions. Analyses of satellite imagery revealed a weak thermal anomaly over the volcano on 22 and 24 February. Cloud cover prevented observations on other days. The Aviation Color Code level was lowered to Yellow. Kilauea (Hawaii, USA). An active lava surface was present about 200 m below a vent in the floor of Halema’uma’u crater. The lava surface circulated and both rose and drained through holes in the cavity floor. Low lava fountains rose from the south edge of the deep pit. A plume from the vent drifted mainly SW and dropped small amounts of ash downwind. Measurements on 25 February indicated that the sulphur dioxide emission rate at the summit remained elevated at 900 tonnes/day (2003-2007 average rate = 140 tonnes/day). Lava from beneath the Thanksgiving Eve Breakout (TEB) and rootless shield complex flowed SE through a lava tube system and broke out onto the surface. Thermal anomalies detected by satellite and visual observations revealed active lava flows on the pali and on the coastal plain. Incandescence was sometimes seen from a vent low on the S wall of Pu’u ‘O’o crater. Kliuchevskoi (Russia). 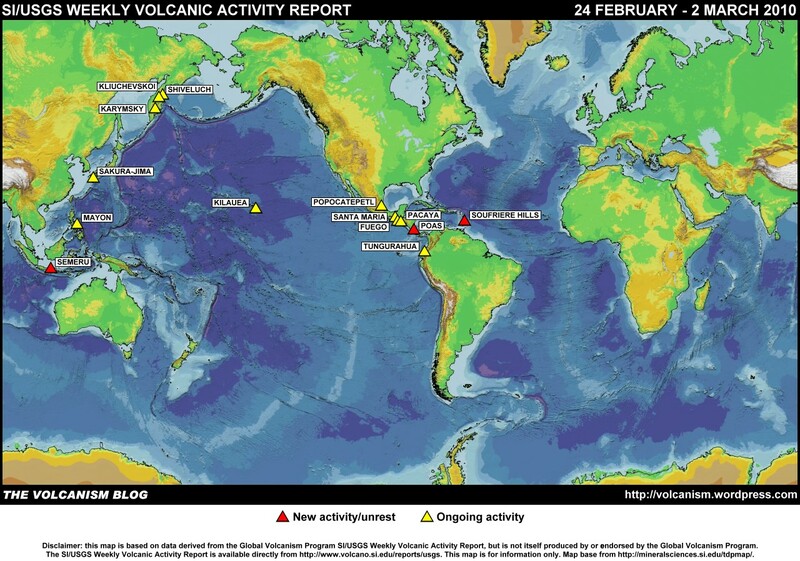 During 19-26 February seismic activity was above background levels and lava continued to flow down the NW flank. Strombolian activity periodically ejected material 300 m above the crater and phreatic explosions occurred from the fronts of the lava flows. Satellite imagery revealed a large daily thermal anomaly at the volcano and gas-and-steam plumes that drifted 90 km NNW on 23 February and 25 km ESE the next day. The Aviation Color Code level remained at Orange. Mayon (Philippines). Seismicity, deflation and sulphur dioxide emissions have been consistent with post-eruption levels. Rising steam and incandescence from the crater was not indicative of any new activity. The Alert level was lowered to 1 and the public was reminded not to enter the 6-km-radius Permanent Danger Zone (PDZ). Pacaya (Guatemala). On 26 February explosions ejected tephra to 150 m. Bluish-white plumes drifted N and a lava flow traveled 800 m E.
Popocatépetl (Mexico). During 24-28 February emissions of steam and gas were observed. Plumes contained small amounts of ash on 28 February and 1 March. Sakura-jima (Japan). During 24 February-2 March explosions produced plumes identified in satellite imagery and seen by pilots. The plumes, occasionally containing ash, rose to 1.5-3 km a.s.l. and drifted N, NE, E, and SE. Santa María (Guatemala). Explosions from the lava dome complex produced ash plumes that rose to 2.8-3.1 km a.s.l. and drifted E and NE. Ash fell in areas downwind. Shiveluch (Russia). During 19-26 February seismic activity was above background levels, possibly indicating ash plumes rising to 5 km a.s.l. Fumarolic activity was occasionally observed. Ash and snow fell simultaneously in Klyuchi, 50 km SW, on 21 February. Analyses of satellite imagery revealed a large daily thermal anomaly from the lava dome, and ash plumes that drifted 30 km to the N and E on 23 and 25 February, respectively. Gas-and-steam plumes drifted 60 km N during 18 and 22-25 February. The Aviation Color Code level remained at Orange. Tokyo VAAC reported that on 26 February an ash plume rose to an altitude of 3 km a.s.l. and drifted NE. Tungurahua (Ecuador). During 24-28 February as many as 11 explosions were detected by the seismic network. Explosions were not detected on 1 or 2 March. Ash plumes were seen when weather permitted during 24 February-1 March rising to altitudes of 6.5-8 km a.s.l. and drifting SW and W. Ashfall was noted almost daily in areas downwind. 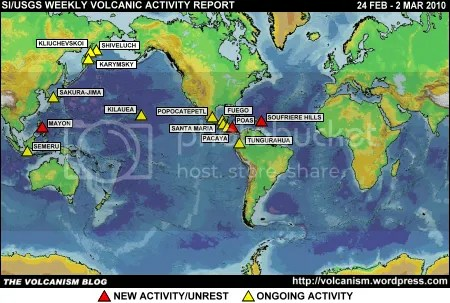 The foregoing is a summary of the Smithsonian Institution/United States Geological Survey Weekly Volcanic Activity Report covering 24 February-2 March 2010. It is provided for information only, and is based on but not a substitute for the full report, which comes with its own criteria and disclaimers. The map base is derived from the Smithsonian Institution/USGS/US Naval Research Laboratory This Dynamic Planet website.